The Scottish Qualification Authority says it will review its assessment criteria after reports a disabled student will be denied a journalism qualification because he cannot take shorthand. As reported earlier this week, Glasgow Clyde College student Kyle Gunn, left, has been told he will not receive higher national diploma in practical journalism by the SQA even if he completes the course. 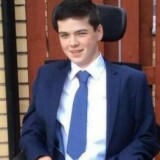 Kyle’s cerebral palsy means he is unable to take the shorthand section of the course, but the SQA has said it will now reconsider after the National Council for the Training of Journalists issued a statement clarifying its own position on disabled students and shorthand. The statement says the body makes “reasonable adjustments and gives special considerations to learners with particular needs” for all of its qualifications. The statement adds: “The NCTJ Diploma in Journalism is an industry-designed vocational qualification and is recognised as the industry standard, pre-entry qualification for trainee journalists. Shorthand is an elective component of the diploma, which means that learners may complete the qualification without shorthand. The NCTJ said it was unable to comment on SQA policies. An SQA spokesman said: “We are seeking urgent clarification from NCTJ on their position with regard to reasonable assistance and exemption from shorthand requirements for disabled learners.